This section features answers to many questions often asked by our customers about our wicker & rattan furniture. If there are any other questions or special requests you may have, you can call us at 1-800-894-2537 and we will be glad to assist you. Question #1: What is the difference between wicker and rattan? Answer: Wicker is a catch-all term for any woven product. 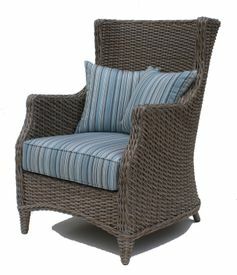 A piece of wicker furniture can be made of rattan, seagrass, peel, or it can be even made of plastic or resin wicker. Rattan is a vine that grows primarily in the jungles of Southeast Asia. The vines can grow up to 500 feet long, and they are pound for pound stronger than steel. When left in its 1.5"-2.5" Diameter, the pole of the rattan is used to form the frame of rattan furniture. The pole of the rattan can also be cut into smaller strands and woven into wicker furniture. Question #2: Which is stronger: Wicker or Rattan Furniture? Answer: The quality of the furniture frame is more important than whether or not it is made of wicker or rattan. We look for furniture where the frame is solid and does not sway. Question #3: Can I use wicker outside? Answer: Since the 1800's, wicker furniture has adorned the front porches of America's finest homes. Wicker Furniture can be used in any covered area. If you wish to have extra protection from the elements or to use the furniture in an uncovered area, you should choose synthetic wicker or resin wicker furniture. Question #4: I would like to put a wicker set in my screened-in porch; however it can get very cold/hot. Will the temperature have any effect on the wicker? Answer: Wicker furniture is not adversely affected by either cold or hot temperature. In our more than twenty years in business, we have warehoused wicker furniture in areas without climate control, and have observed no negative effects on the furniture. Question #5: Do I have to put the furniture together? Answer: All furniture is fully assembled and put together unless otherwise noted. All you need to do is take the furniture out of the boxes and enjoy it! Question #6: I would like to purchase your furniture, however my house/sunroom is being built/not ready yet. Can you hold my furniture until I am ready to receive it? Answer: Yes, we can take your order and arrange for your furniture to arrive at your home when you are ready for it. Question #7: How long have you been selling wicker & rattan furniture? Answer: We have been selling the finest quality of wicker and rattan furniture for over 30 years. Wicker Paradise is a third-generation family-owned-and-operated store located in the suburbs of Westchester, New York. If you have any other questions, you can call Wicker Paradise at 1-800-894-2537 and we will be happy to assist you.